Recommended as a biologically active food supplement, a source of hydroxy-cinnamic acids and flavolignans. Also contains essential oils. 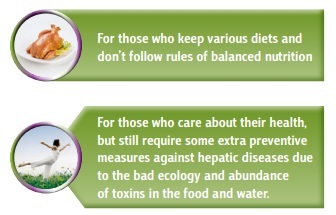 Those who care about their health and require preventive measures against hepatic diseases at least twice a year: in spring and autumn. Recommended for adults to take 1 capsule twice per day during meals with water. Facilitates normalization of the digestive system performance. 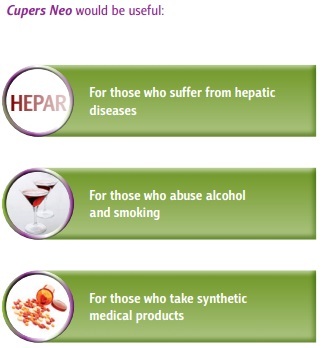 Cupers Neo ingredients are balanced together in order to provide for the comprehensive support of liver: they promote synthesis of gall, its separation and outflux, improve gall properties, reduce its viscosity and the amount of bile acids, facilitate better functional performance of liver. Unlike most other complexes that target solely and exclusively liver, Cupers Neo normalizes digestion, thus reducing functional load on liver as the main organ of the digestive system.